Director Penelope Spheeris’ Decline of the Western Civilization documented the Los Angeles punk scene during a time when people only seemed to care about punk kids and bands from England. She allowed American kids with mohawks to realize that they didn’t have to sport bad British accents to be more than a mullet wearing fan of Styx. She gave a look of homegrown bands including the Germs, Black Flag, Circle Jerks, X and Fear. She showed a life where the musicians weren’t rock stars living in opulent mansions and letting money fly through the air. So it was only right when it came time to do a dramatic film about punks in Los Angeles that Spheeris would return to this subject with Suburbia. Sheila (Jennifer Clay) is hitchhiking on a highway in Los Angeles when gets picked up by a woman and her toddler. However this act of kindness goes bad fast when the car gets a flat. They find a phone booth, but a wild dog finds them. The worst outcome happens. Evan runs away from home not wanting to be near his drunk mom anymore. During a punk rock show, he finds himself meeting kids who talk about how they’re squatting at a place that he can also stay at. Trouble is it’s called the T.R. House and if you move in, you have to get branded with a TR which stands for The Rejected. Evan meets Sheila and decides it might be worth the body art. But there’s no time for a peaceful life in the punk rock house. Locals aren’t happy at the wild dogs that live in the abandoned subdivision. They drive through and shoot anything that moves. Plus there’s other punk rock gangs wanting to cause trouble at shows by T.S.O.L. and The Vandals. Of course if they wanted peace, they’d run off to a hippie commune in the countryside. These kids are always dealing with trouble until the heartbreaking final frame. Because Roger Corman’s produced the film, there would be no fat budget to ruin the film by making the production department dress down the sets. The T.R. House looks like a squatter house with a messes and other squalor sights. The punk rock clubs look edgy, dangerous and potentially sources of tetanus. The kids are rather real versus the comical casting you’d get around this time on Quincy or CHiPs punk rock episodes. Among the kids is Flea before he stuck iconic in The Red Hot Chili Peppers. Penelope Spheeris didn’t betray her credibility going from documentary to dramatic in Suburbia. It’s also good that Suburbia has now been upgraded to Blu-ray and part of Shout Select like her follow up Dudes. The video is 1.85:1. 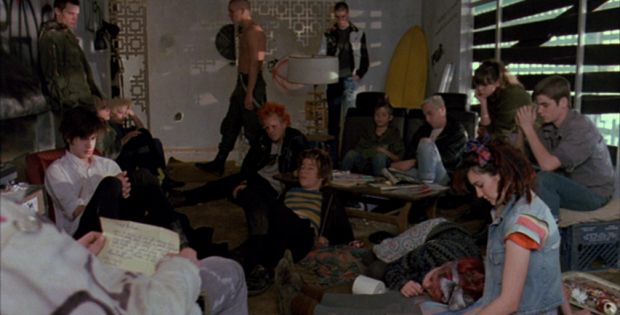 The transfer brings out the messy details of the punk rock life in the ’80s. The audio is DTS-HD MA Mono. The levels are fine for the punk rock shows and the dog attacks. The movie is subtitled. Audio Commentaries include a solo chat from Director Penelope Spheeris and a second where she is joined by Producer Bert Dragin and Actress Jennifer Clay. There’s a lot of recounting how low budget things were and how Spheeris didn’t come in as a pure tourist looking to exploit the kids. Still Gallery is shots from the punk rock shows and more. Trailers (2:35) includes red band action! Shout! Factory presents Suburbia. Directed by Penelope Spheeris. Screenplay by: Penelope Spheeris. Starring: Bill Coyne, Chris Pedersen, Jennifer Clay, Timothy Eric O’Brien, Wade Walston and Flea. Rated: R. Running Time: 94 minutes. Released: January 29, 2019.